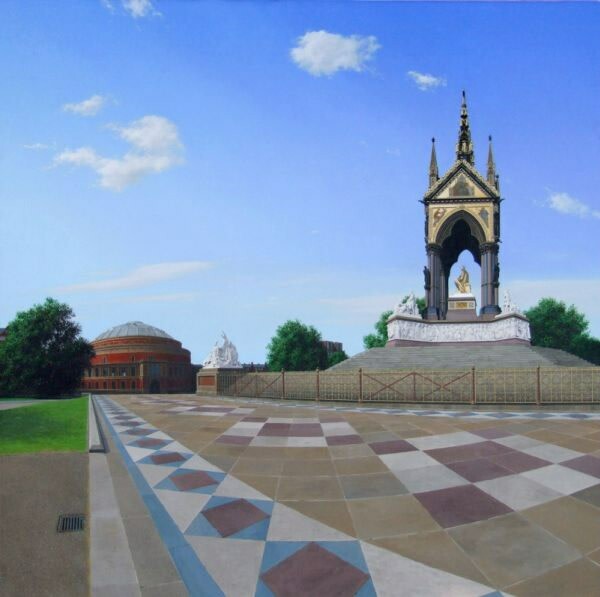 Steve Whitehead is one of the most significant realist painters working in Britain today. This importance arises from two aspects of Whitehead’s work. The first relates to Whitehead’s affinity with almost every other British realist painter to be seen exhibiting in London at the moment, and the second to his difference from almost all those other painters. Like most British realist painters Whitehead owes a strong debt to American Photorealism of the 1960s and 70s, something that can be seen most clearly in works such as Millennium Bridge and Thames Barrier. But when we make this statement we need to remember that Whitehead, together with his friend Clive Head, was looking at American artists like Richard Estes, Ralph Goings and Robert Bechtle long before they were widely known in Britain. In a very real sense Whitehead is a pioneer, and it is partly out of his prescient interest in American Photorealism that the current vogue for British Photorealism has emerged. Yet the significance of Whitehead is more than the fact he helped to introduce the British to a neglected form of American painting. Whitehead has been experimenting with the lessons learned from America for long enough to allow his art to develop away from this source into a very British form of realist art. In practice this means that Whitehead does not simply repeat the radical experiments made by artists such as Estes in the 1960s, rather he takes the lessons learned from those experiments and uses them to create a new form of painting. These paintings cannot any longer be described as photorealist, although they clearly have that origin. Instead they should be recognized as a new realism. In this development Whitehead has taken traditional Photorealism on a journey in which it has been combined with lessons learned from other art movements, including German Romanticism and early twentieth century English realism, each of which has become just as important in defining his art. It is no wonder Whitehead shuns the word ‘photorealism’ when discussing his work as he is clearly not a slave to either the legacy of Photorealism or the photograph itself. Look at his paintings for long enough and an enormous range of influences slowly reveal themselves, from Caspar David Friedrich to Meredith Frampton and others. This work is not by a painter of photographs or a man who disengages his humanity to become a human enlarging machine. It is the product of an intensely human and humane artist, a maker of rich and rewarding works of art. - Michael Paraskos is a writer and broadcaster on art and author of a new book entitled Steve Whitehead: Realist Painter, Orage Press 2008, ISBN 978-0954452315.